We are making images that show connections between different struggles. We are compiling images that show that pitting the oppressed against each other only serves the oppressor, and will not work. We are making clear that all forms of oppression are different manifestations of the same ideology. We are making clear that all forms of oppression come out of the fact that the social world was built by certain bodies to serve certain bodies. We are making images that address the interlocking of systems of oppression. We are making clear that our struggles are tied, across the nation, and across the globe. We are showing that learning, and knowledge, is found in other communities - in a bigger community. Different forms of oppression are informed by the same ideology, and manifest in different structural aspects! Oppressed groups are often pitted against each other which only benefits the oppressor! Coming together in joint struggle does not diminish or get in the way of each struggle! Coming together in joint struggle elevates all! We have something to learn from each other’s struggles! We have something to learn about our own positionalities in struggles against oppression! We must work against our oppression! We must recognize our role as the oppressor! Solidarity! One struggle can illuminate another struggle to those who know one, or none, or both of the struggles. To those who come from within a struggle and must learn about the other, to those who come from both and are forgotten, to those who come from neither and must work harder to educate themselves. Solidarity! The limitations of a movement in relation to the multiple identities within it can be understood when two movements come together. Recognize the gaps, recognize how entire populations are left out, are caught in the intersections! Solidarity! Recognize that intersectionality lives in humans. Solidarity! A joint struggle empowers all! Does not ignore complexity! Learns and grows! THE INTERNET has made knowledge widespread. THE INTERNET turns information widely available. THE INTERNET makes information overwhelming to engage with. OUR PLATFORM seeks to make information accessible and easy to understand. OUR PLATFORM makes education on the different struggles more clear. 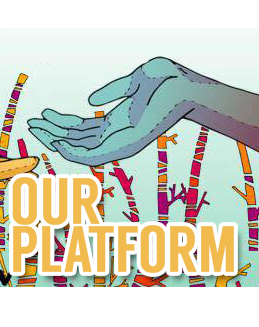 OUR PLATFORM shows the ties between the struggles. OUR PLATFORM expands the notion of audience. OUR PLATFORM turns the intersections of these issues into a tool for education, SOLIDARITY, and work. THE INTERNET is inaccessible to many. We will carry OUR PLATFORM beyond the confines of the internet through zines, flyers and posters. We will spread the word of OUR PLATFORM by blasting public spaces with the URL address. A white disabled person who has benefitted from white privilege in innumerable ways, but most notably, in the context of this project, in the way her disabilities are seen and accommodated because of her Whiteness. An Indigenous person whose history and struggle is interlocked with that of their Black brothers and sisters. The presence of whom is necessary to achieve collective liberation from the oppressor and reclamation of that history. An International White Ally to the BLM struggle and an Israeli whose existence and upbringing has perpetuated the oppression of Palestinians. To draw the similarities (“but not sameness”) between the two manifestations of oppression as a tool for education about the two causes to both Israeli and White American audiences. To merge the empathies and goals of the white disabled community with the black disabled community, of the Black Lives Matter movement with the black disabled community, of the white disabled community with the Black Lives Matter movement. To address and promote the hidden intersections throughout history between Black and Indigenous Lives. To recognize the present day struggle that exist among all non-white, straight, cis, able-bodied communities. We are capable of helping push each other's movements forward! WE are not free unless that freedom makes space for those of us who most need it! WE are not free until Black Lives Matter! WE are not free until Black Disabled Lives Matter! WE are not free until disabled people of any and all intersectional identities matter! WE are not free until Indigenous and Black peoples are given proper reparations! WE are not free unless Palestine is free! WE are not free until People of Color are no longer targeted by environmental racism! WE are not free without racial justice! WE are not free until we address, re-write, reclaim history!